A “travlin man,” your humble narrator had some business to attend to in Greenpoint last Thursday which was meant to be followed by helping out on a Working Harbor Committee excursion in the evening. The WHC trip was leaving from Lower Manhattan’s Pier 11, so the logical path was to catch the East River Ferry from Brooklyn to the City. While onboard, I spotted something fairly curious. 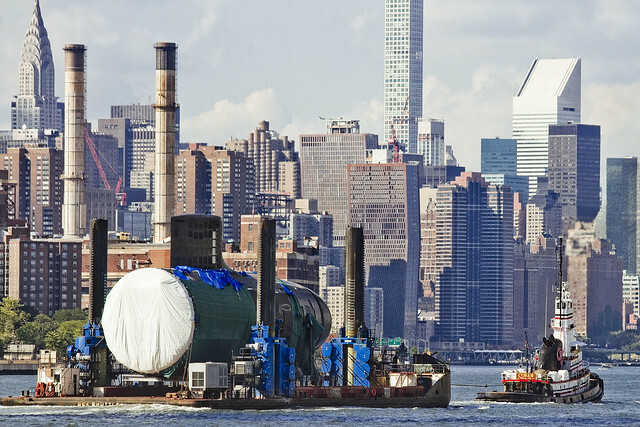 Is that the nose of a submarine being towed on a barge? The tug doing the towing was the GT Lyman. As is usually the case, tugboatinformation.com has everything you’d want to know about the Lyman on display at their site. 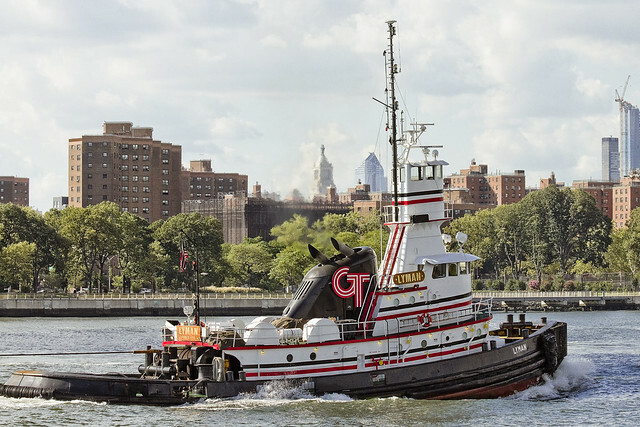 To sum up – she was built in 1968, is owned and operated by Delaware’s Gateway Towing, and can normally be found in the waters around Philadelphia. 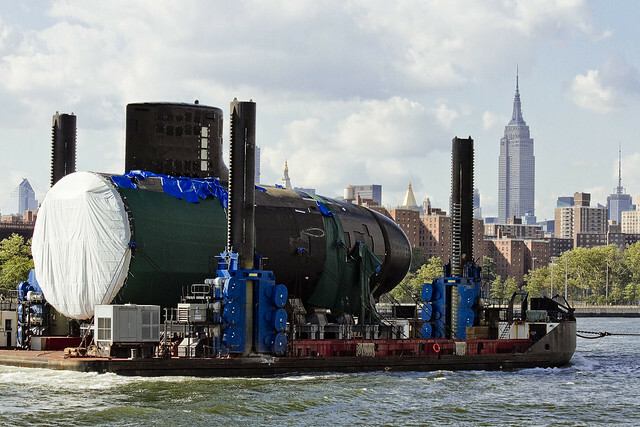 What Lyman was towing looks very much – to me at least – to be the front section of a submarine. 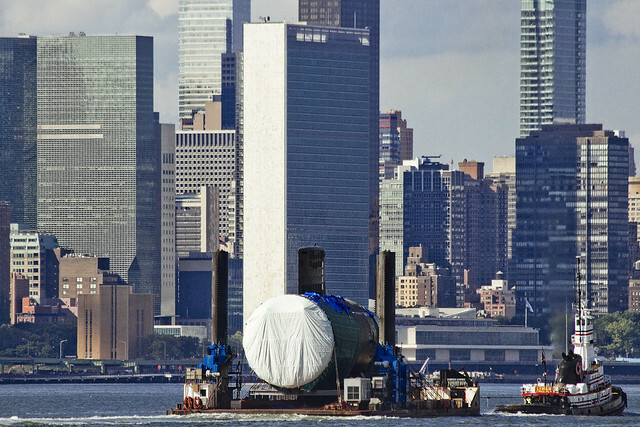 Maybe I’m being crazy here, but there’s a conning tower and… that’s a submarine. 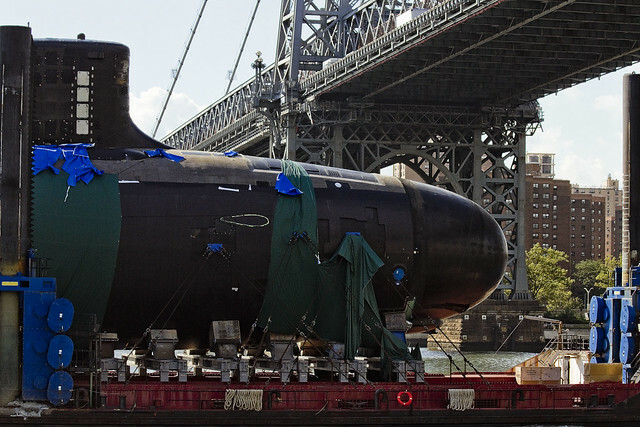 Now, I’ve taken lots of shots around NY Harbor but I’ve never taken a photo of a submarine before. 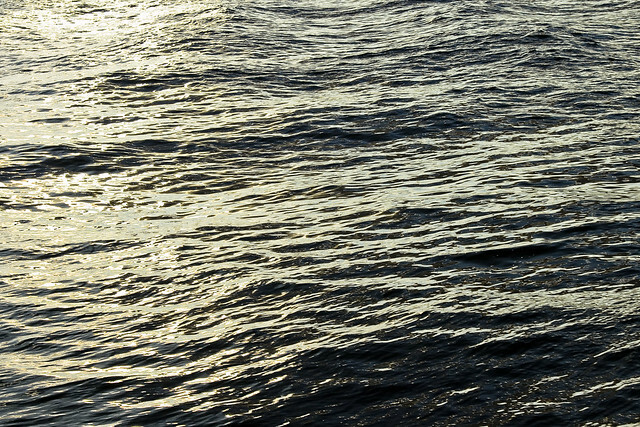 Actually, I probably have, but pictured above is what you’d normally get in a shot of a submarine. One was kind of hoping that the Lyman was going to execute a turn into the Brooklyn Navy Yard, but it continued heading north along the East River. Probably Headed to New London via the Long Island Sound. Just happened to be driving through yesterday and noticed there is a submarine base there. What’s with all this “business” you’ve got going on in Greenpoint? Always one kind of meeting or another. 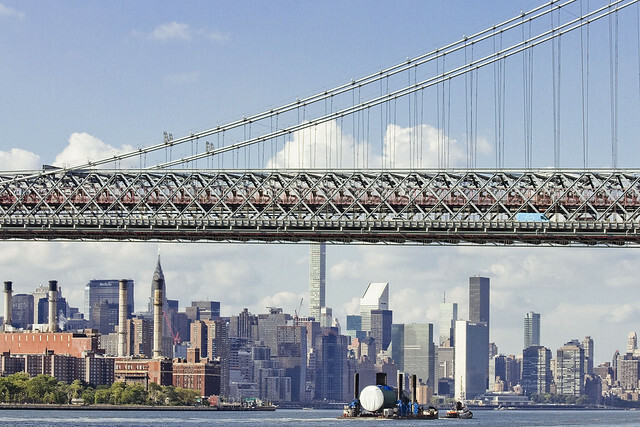 Reblogging Mitch Waxman’s recent Newtown Pentacle post about an astonishing sight on the East River. Thanks Mitch for the fascinating piece! My guess is bound for General Dynamics in Groton, CT?